I’ll be honest and say that sometimes I’m not quite a dilligent on my skincare routine as many of my fellow bloggers. Sure, I love a double cleanse and an acid based exoliator as much as the next but in the past I’ve been known to chop and change my routine, maybe go a little lazy on the steps and generally not be quite consistent enough in the longer term. But since moving I’ve upped my game so I wanted to do a run down of my current skincare routine as it stands right now. To make it a little easier to digest, I’ve broken down into the different steps of cleanse/day/night/treatments and eyes…. kicking things off with a look at the cleansing based products. Eye Make Up Remover: Mascara is my daily go-to, on the most minimal/laziest of days I’ll always be found wearing mascara at least. So this is essential. My go to for a while now has been Lancome Bi Facil Make Up Remover*, simply because it does a great job. Doesn’t feel oily but removes even waterproof mascara without too much rubbing. Micellar Water: For a double cleanse I’ll remove make-up first with REN Rosa Centifolia 3 in 1 Cleansing Water* as it takes off make-up without leaving skin dry. If I haven’t worn any make-up and not been into London, sometimes I’ll use this as a lazy/quick cleanse. Or just to give skin a quick and easy morning cleanse. Cleanser: When going for the double I’ll use Vichy Purete Thermale Gel Cleanser*. It feels like it really leaves skin clean but not stripped. I usually use this by massaging on to dry skin then using a damp flannel to remove. Feels fresh and doesn’t leave a tonne of residue on skin after. Great if you have combination skin like I do. Toner: Not everyone loves a toner but I like having one in the routine as an optional step. They feel refreshing and can just make sure you’re really thorough on removing any cleanser that might have been missed with the flannel. A nice to have step and this Caudalie Moisturising Toner* is my current favourite. Serum: I’ve come to think of serum as an essential in my routine. It just adds a little something and helps my skin not be too dehydrated. My current favourite is from the brand Sond and it’s a serum that promises to Firm and Smooth. The thing I’ve been liking about Sond as a brand is that it is all about anti ageing for sensitive skin. Sometimes I’m in denial about my skin being sensitive (not the ageing part though, all too aware of this) but this Sond Firm + Smooth Serum* has been really lovely as a pre-moisturiser step to give my skin that extra boost a serum offers. Moisturiser: This Clarins Multi Active Jour Cream* is really lovely. It manages to feel light and refreshing whilst also really hydrating. Not an easy balance to strike. It’s designed to target fine fines along with the other daily ‘stress’ of life (lack of sleep etc). I definitely find my skin is really happy with this and laps it up. The two downsides to this are that it doesn’t have any SPF and the glass jar is really not travel friendly. I’d love to see this come out in a pump/tube option (not glass) so can be a little more portable! Daytime Boost: For an extra little something in the day time I’ve been really loving the Khiels Daily Reviving Concentrate*. I’ve spoken to a few people about this one and always describe it as ‘an oil for people who don’t like oils’. As it really is an oil texture, but far more liquid/watery than the ‘typical’ oil. It has a lot of slip to it and my skin drinks it up. It leave my skin really hydrated and radiant and after a few moments of waiting it’s perfect as a base for make-up. Love this – especially on tired days where my skin needs all the help it can get. SPF: I’ve always aimed to wear SPF daily as know how important it is, but sometimes I’ve relied upon the day cream I’m using instead of wearing a ‘proper’ one. But I’ve upped my game this year so far and been absolutely loving SkinCeuticals Ultra Facial Defence SPF50* – it’s a high factor but still really light on the skin. A little goes a long way and I’m always impressed with how protected my skin has been with this. When I’ve been away and in the sun, I’ve had some moments where I’ve burnt a little or ‘caught the sun’ as they say but never on my face. Testament to how well this works. Love it. Oh, and it makes a fantastic base for make-up too as it’s not heavy/shiny at all. I never really know what to call these ones, but they’re a few products that I sort of add in as and when I feel like I need them to help deal with break outs or extra dry days. 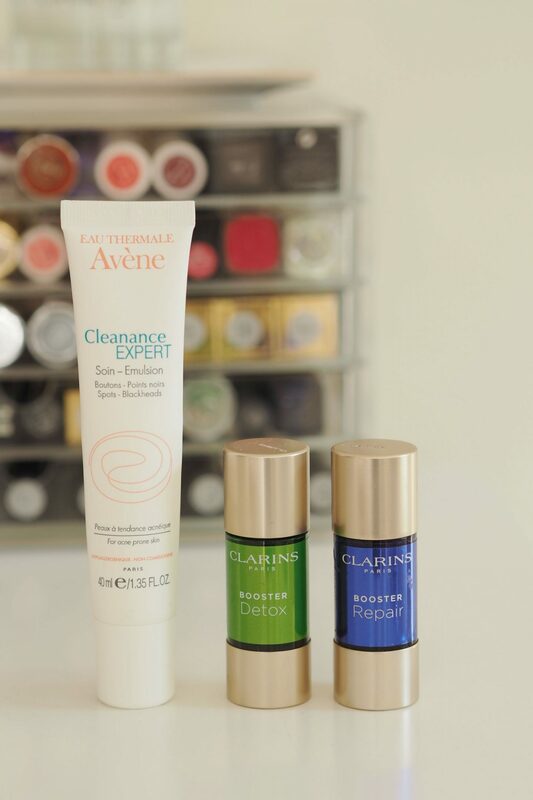 I’ve blogged about the Clarins Boosters in the past and the two that have really stuck as part of my routine are the Clarins Booster Detox* (for when I feel a break out coming on or to help clear lingering spots) and the Clarins Booster Repair* (for when my skin feels really dry and needs a little boost). These are so easy to use, simply pop a drop in your regular moisturiser (I mix them on the back of my hand) and apply as usual. Very handy to have to adapt to day to day changes of your skin. Then I have my go-to for any break outs and something I use regularly on my ‘problem area’ (chin in case you’re wondering) to help clear and prevent any spots. That’s the Avene Cleanance Expert* and it’s a wonder product in my opinion. Manages to clear spots quickly without any irritation or making my skin dry and flaky at all. This is one I just can’t be without since discovering it and very much recommend if you want something to deal with spots that isn’t harsh on skin that can be sensitive. For my eyes I’m on a massive Murad band wagon right now. 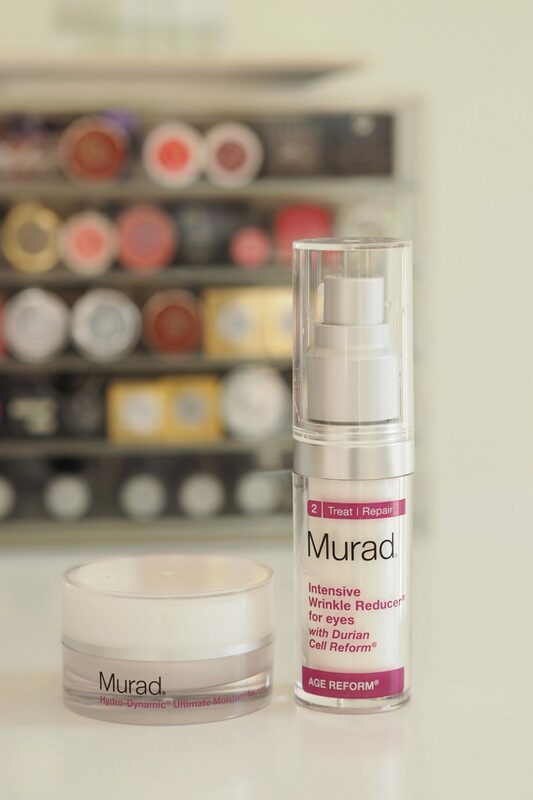 Loving two products, both from the Murad Age Reform line. Every day, morning and evening I’ve been using the amazing Murad Hydro Dynamic Ultimate Moisture for eyes*. Dehydration lines are my biggest issue in the eye are and this is amazing as hydrates without being too thick for the delicate area. Then along side that I’ve been using the Murad Intensive Wrinkle Reducer for Eyes*. I see this as more of a serum/treatment for the eye area as the texture is very different. Sometimes I combine both Murad product, others I just choose the one I feel like using. If you have ‘first/early’ signs of ageing and maybe have dehydrated eye area than these two are a great combination. Moisturiser: Moisture wise I’ve been loving the Clarins Multi Active Night cream*. I actually think I love this one more than the day to be honest. Everything from scent to texture to how it makes my skin feel just works for me. Hydrating without being heavy it’s exactly what I want from a hight cream. I’ll often combine with one of the boosters overnight and if I’m suffering a break out I’ll use my Avene too. But this is a really lovely night cream – again, I’d love to have this in a non-glass packaging option. Treatment: For anti-ageing over night I’ve been using Retinol Reface* – not every night, but maybe every other night or so. It’s a retinol based product that personally I like to combine with a moisturiser to add a anti-ageing touch to my routine whilst I snooze. Retinol is known as one of the most powerful anti-ager products available and this is a fairly ‘entry level’ one. It promises not to irritate and whilst I haven’t had any issues, others might as some just don’t get along with Retinol based products. Of course as with any post around skincare, this is just what’s been working for me. I have dry/combination skin with problem areas of dry around my eyes and breakouts (normally hormonal) around my chin. My skin is sensitive in that it goes red easily, but doesn’t tend to react more than that. Hope this helps if you’re looking for some new additions or switching things up in your skincare routine! woah you put my skincare routine to shame! Literally you use so many products haha! Ah! I thought I’d managed to make it pretty concise! Not every single one is used every day though! I love the sound of the Kiehl’s ‘oil’ and I’m desperate to get my hands on the Clarins Boosters! Great news the Multi active day now has Spf20! Do you have any experience of ‘By Terry’ thinking of investing in her click brush foundation?